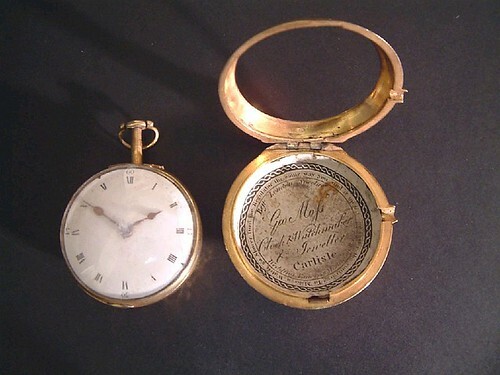 Mid-1500s: First wearable timepieces: several inches in diameter worn on chain around the neck or pinned to the clothes --- "later in the century there was a trend for unusually shaped watches, and clock-watches shaped like books, animals, fruit, stars, flowers, insects, crosses, and even skulls (Death's head watches) were made." 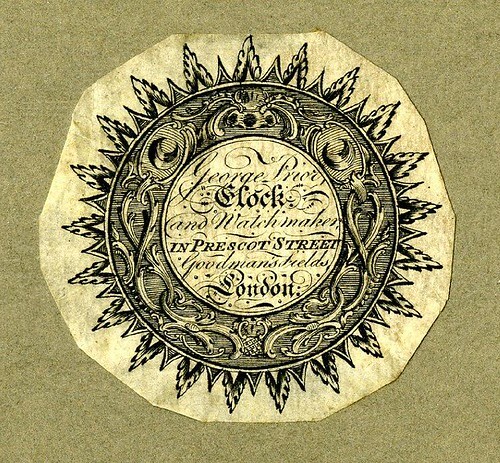 Hands up anyone who knew what a watch-paper print was? Yeah, I thought so. Me neither. Even after jagging all the images I wasn't quite sure how they were specifically used until I found that last picture above. 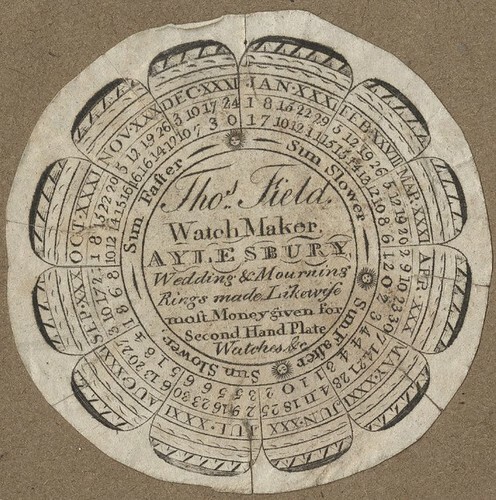 Originally designed as a simple protective insert, watch-papers came to be used as an advertising medium for the watchmakers in the second half of the 18th century and another means by which print artists could ply their trade. 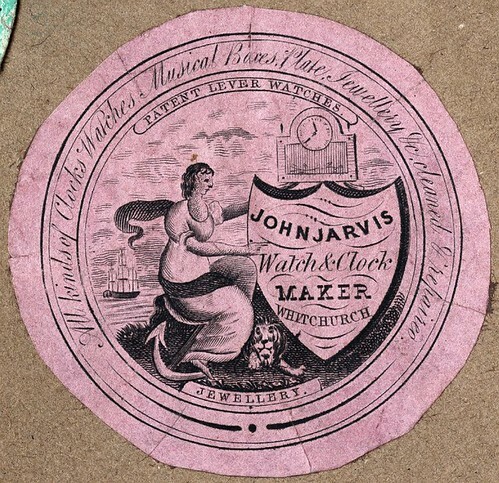 These types of 'professional' or conservative watch-papers form the majority of the genre, but a popular 'amateur' variety also emerged that were valued as keepsakes. "Women embroidered flower patterns on silk watch papers and made cutout or pinpricked designs of hearts, doves, forget-me-nots and wreaths. They also made them of woven hair or crocheted them from fine silk thread or quilted them. Hand-stitched monograms in wreaths of laurel or moss roses and hand-painted watch papers were especially popular. 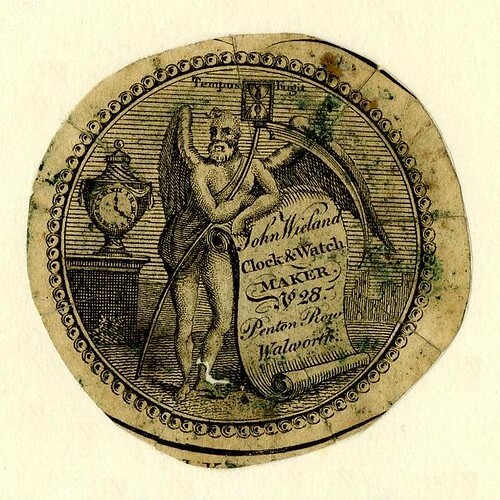 Often early handmade watch papers took the form of a valentine or birthday greeting or a memorial for dead loved ones, showing a tombstone shadowed by a weeping willow. Examples have also been found with the Lord's Prayer in minute hand-writing and with a miniature map of part of the United States." 'American Watch Papers' by Dorothy Elizabeth Spear, 1951/2 - WorldCat record. 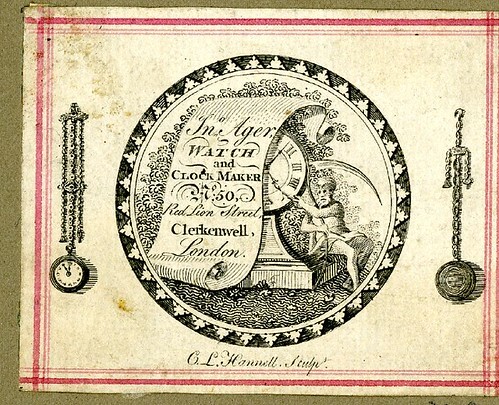 Lew Jaffre has a few more example pictures at Confessions of a Bookplate Junkie (including one engraved by Paul Revere in 1781). 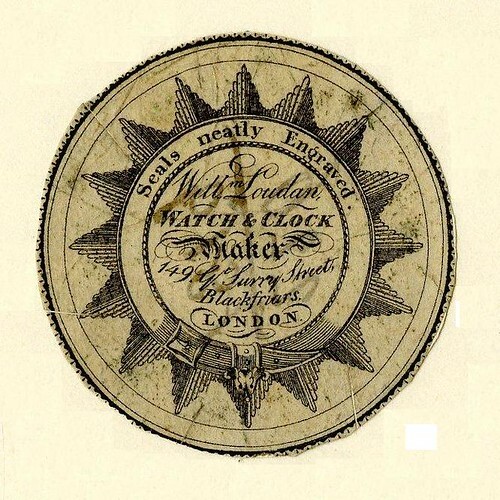 Addit: The National Association of Watch and Clock Collectors has a museum in Pennsylvania. The one you've put "what" after is a cryptogram. 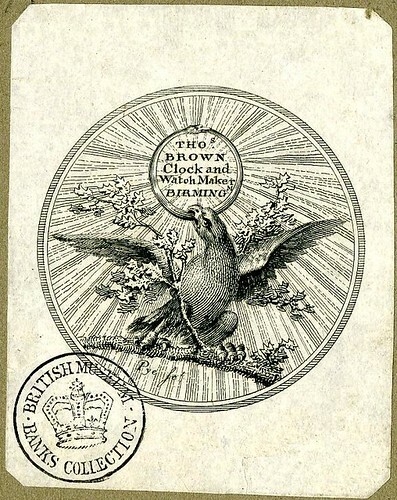 It says "Be (bee) watchful." I expect you two lightning round responders to be here front and centre for the next post. Hint: brush up on your Dutch. T R Hummer beat me to it! Be watchful. #8 is so interesting and unexpected. #8 is perhaps an early rendition of a smiley face. I have to admit it's my least favorite of the bunch. But all of these are fascinating. 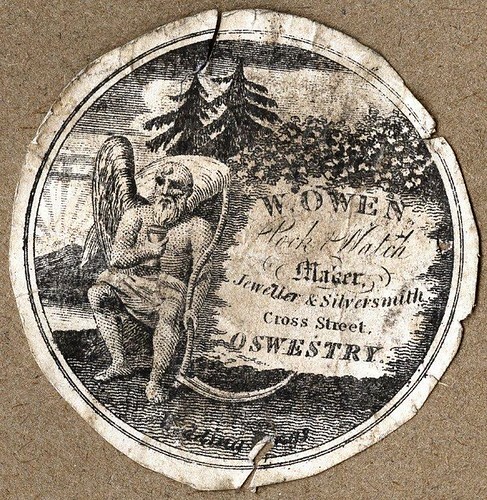 There seems to be so much ephemera in the world. I had no idea these were collectibles. OR that they even existed. Wonderful. Thanks for sharing. "Esoteric" is decidedly the word. 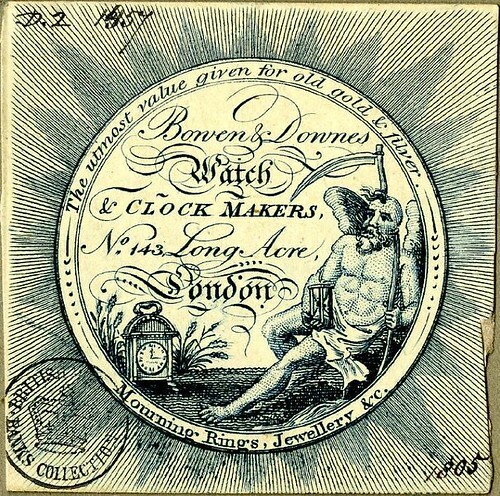 Oh, I am proud (and slightly worried) about knowing what watch papers are! A very odd thing for a teenager to know, but that's me. Fantastic. I had never heard of these before, and now I am dying to get my hands on one. Will have to keep my eyes peeled. Although I'm not particularly into tattooing I often speculate on how great some of the stuff you post might be if incorporated or modified into a modern tattoo design. There are some great layouts and typography here, especially the Richard Whiteaves paper which would look great when tweaked a little. Extraordinary and wonderful! Thanks so much for this posting. I have a small collection of watch papers, but I had no idea of the broad variety that existed until now. 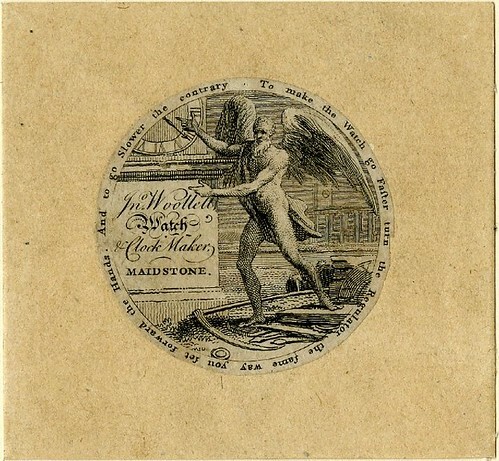 Thanks especially for the link to the British Museum site. Fabulous, and such high quality images with every little tear discernible. I have been disturbed by the smiley-face ever since I can remember -- I thought it came upon us sometime in my 20's, from out of nowhere. Now I know it's going on 300 years old. Does anyone know if there's an earlier one? Elatia, I have two equally compelling, although perhaps slightly contradictory, thoughts related to the smiley face. 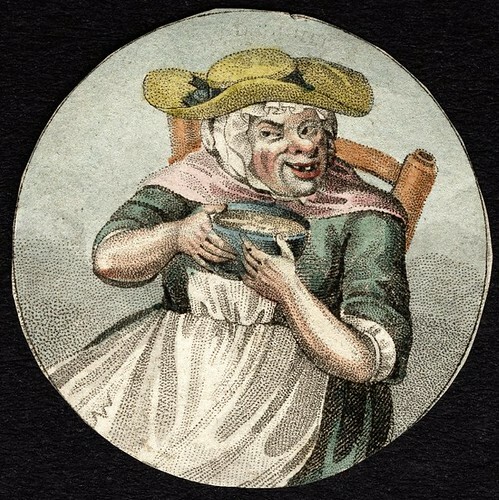 First is to resist my usual urge to go searching because an unsophisticated face drawing with a smile is bound to be ubiquitous throughout history, suggesting that the search would be very difficult to say the least. And the concept of a smiley, or at least the type of face to which I think you refer, is always in a circle isn't it? 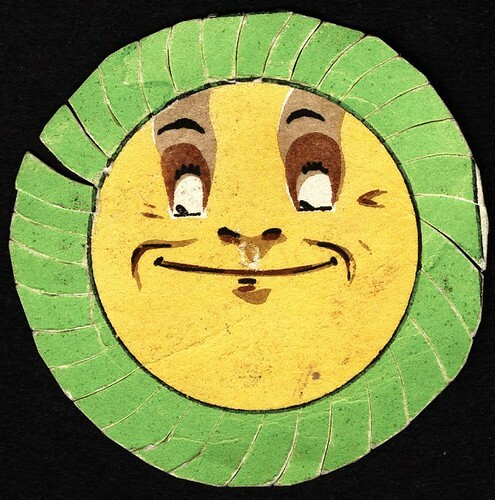 Because these roundels for the watch-papers are purpose-cut of course, meaning that the smiley up above might just be an accidental smiley and that the 1920s are still the more likely time of its true origin, n'est-ce pas? Oh. Oops...the smiley above does have a circle: scratch that part 2 and remove the contradiction caveat then. Ha! The smiley face was invented by Harvey Ball in 1964. *search twice, comment once* ought to be my motto. I was just going to say, I didn't think Elatia dated back to the 1920s. Interesting, though, that the horrible yellow smiley-face didn't make it to my neighborhood until about 1971. Then they were everywhere. I used to draw fangs on them, of course. 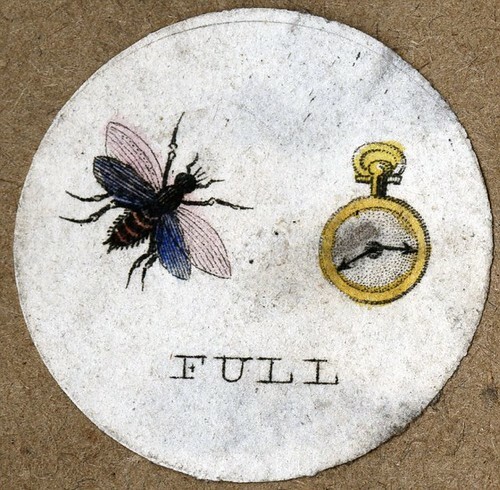 I have to agree with Karla - I thought the insect was a fly - something along the lines of "time flies" but I couldn't see how the "full" related. Have bees changed that much? Thanks again, Peacay, for a fantastic find and for sharing it with all of us! I'm obliged to David Shields from the College of Fine Arts at the Univ. of Texas, Austin, for passing on an article on watchpapers from 1948. 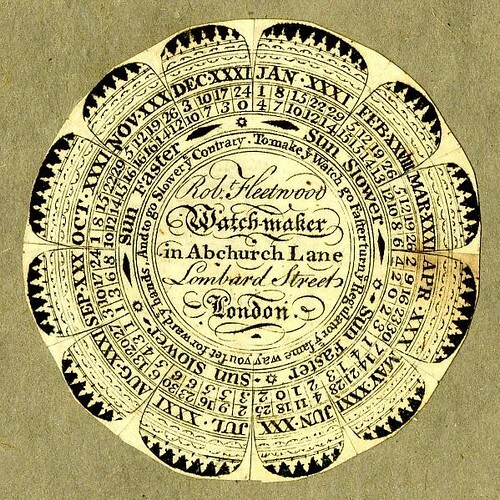 'Watchpapers: A Neglected Deceit' by Roland Knaster appeared in the quarterly UK magazine, Alphabet and Image. 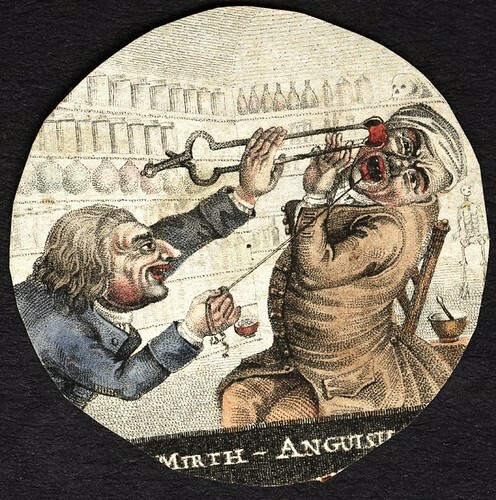 "Watchpapers were discs that were used by Georgian and Victorian watchmakers, they were used to prevent dust from entering through the keyhole and were put between the watch and the outer case. At first they were made from linen, but eventually white paper, pink, green, or yellow paper became the standard. 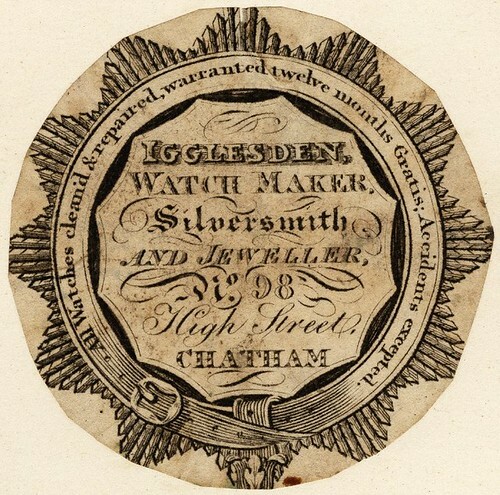 Later the watchpapers were engraved and decorated with a horological motto, or verse. 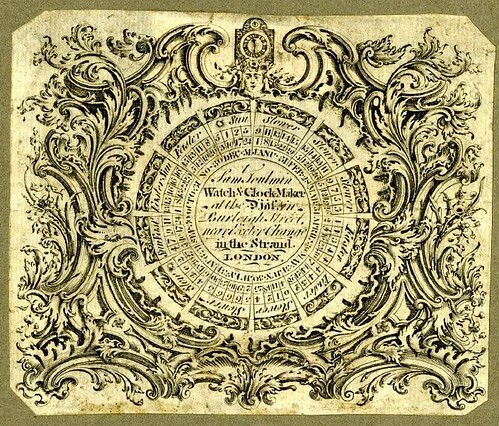 Some of the watchpapers have intricate borders, and some not so intricate, but they all have a border which keeps the illustrations/ mottoes trapped in a circular shape. 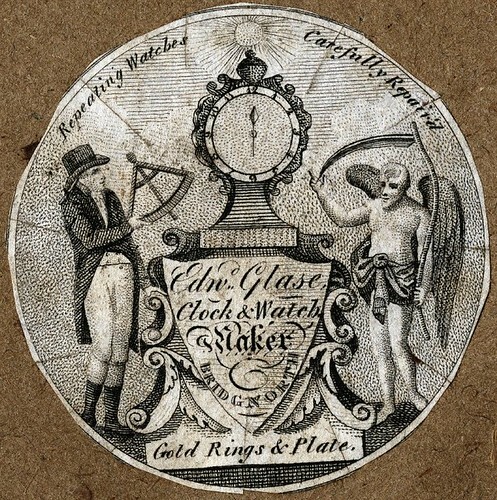 Many of these watchpapers have the mottoes that a loved one would have engraved for special occasions. 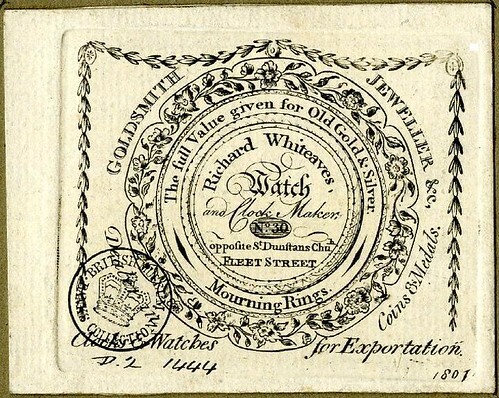 The development of the watchpapers can be broken down into 4 stages, the first has fully decorated, but readable announcements from the early 19th century. 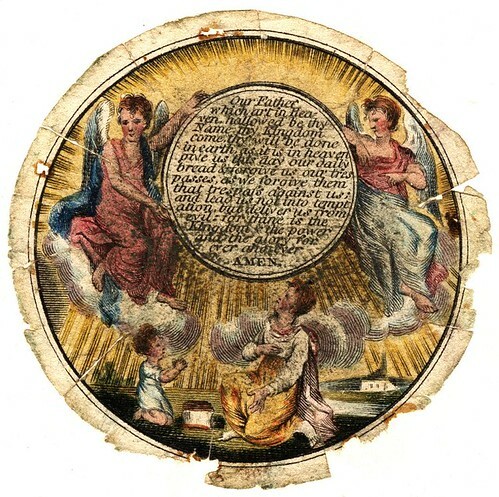 The second, is whimsical and sometimes religious pieces, like The Lord's Prayer, which has been printed on embossed paper. 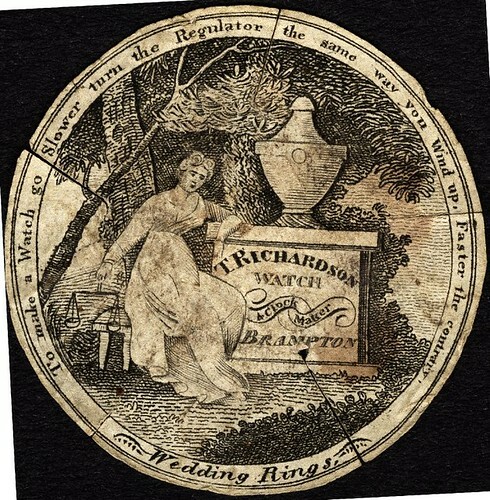 The third is a lithographed example that still shows allegiance to Thorne's fat face type from the late 19th century. And the final stage is a modern example, small and practical, without being too overly decorative, like in previous generations." 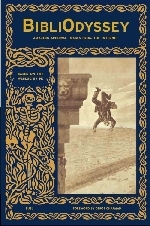 "Amongst mottos, as may be expected, tempus fugit, and for the uninitiated, time flies, were supreme, but it is the verse, reminiscent of so much sepulchral-verse written for children in the early nineteenth century, that brings us, unrepentant sinners, to an immediate decision to confess without delay. May I conclude with one of these immortal, or maybe mortal verses?"